These new box systems allow anglers to organise their essential accessories using configurable inner compartments. 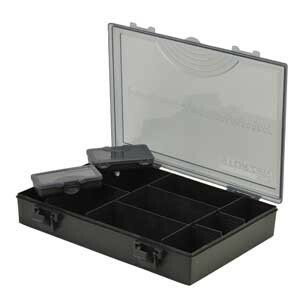 Two small storage boxes ideal for shot, swivels or hooks are included and a handy measuring scale on the lid. FEATURES - Configurable compartments ● Measuring scale on lid ● Secure clamp closing. FREE Delivery on all Shakespeare Fishing Boxes over £100!! !